It’s finally Friday!! 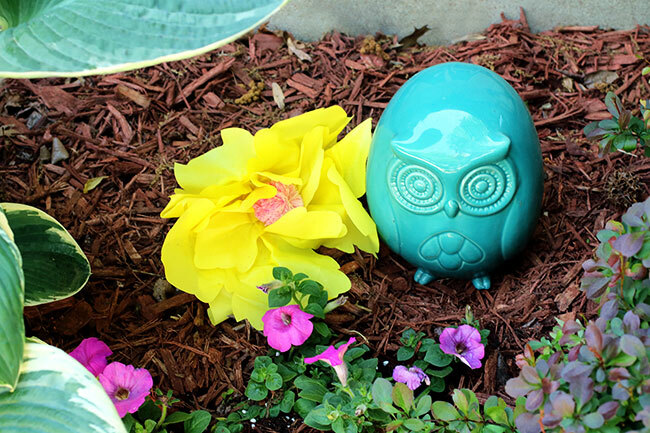 Lauren and I are here again with another post for our Summer Gardening Series! 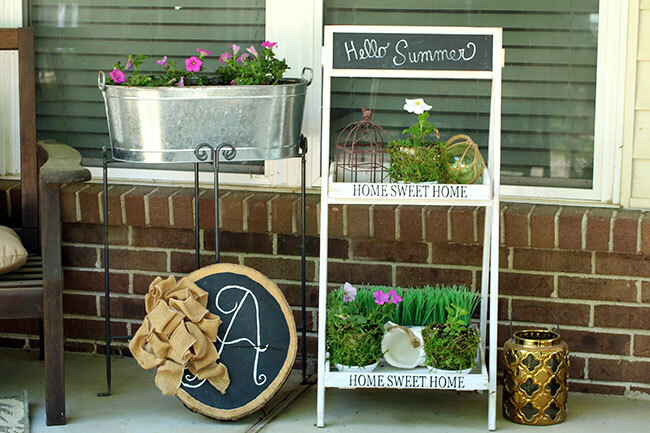 Today I am sharing my Summer Front Porch and you can keep reading all the way to the bottom to see what Lauren is working on. 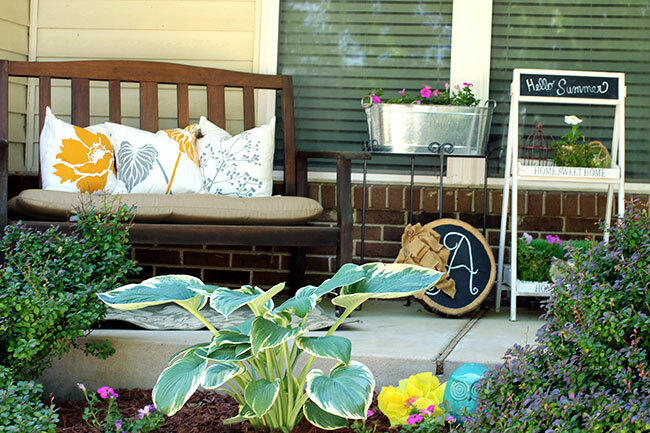 Last summer I worked with a group of bloggers on a Curb Appeal blog series. I worked really hard on my front porch and painted the door white and monogrammed it, stained the bench and updated the pillows and more! So… honestly, it was really easy to decorate the front porch this year! Since Curb Appeal, I did have my mom help me power wash the front porch (and our white fences out back- thanks, mom!) and WOW… it really helped make it look a lot better! I do have a bush that I want to tear out this summer (it is in the far right of the above photo). It is half dead. 🙁 So, that is on my to do list for this summer! We are also thinking about getting our soffit and fascia redone with siding, because it is wood right now and I’m tired of having a painter paint it every 5 years or so. These urns I monogramed awhile back and I just love them! I usually find some arrangements at Lowes that are already done and stick them in the pots every Spring and they last all Summer! 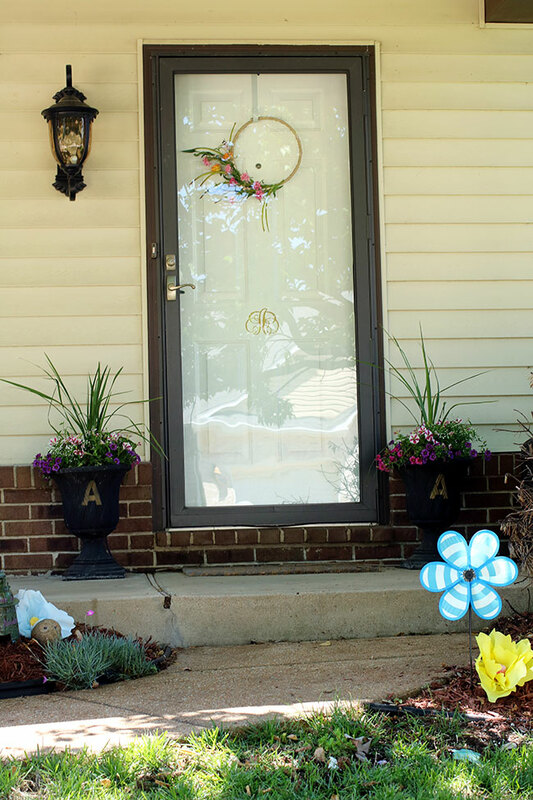 This hoop wreath was done recently for my 12 Months of Wreath post and I just love the pop of color it adds to the door. 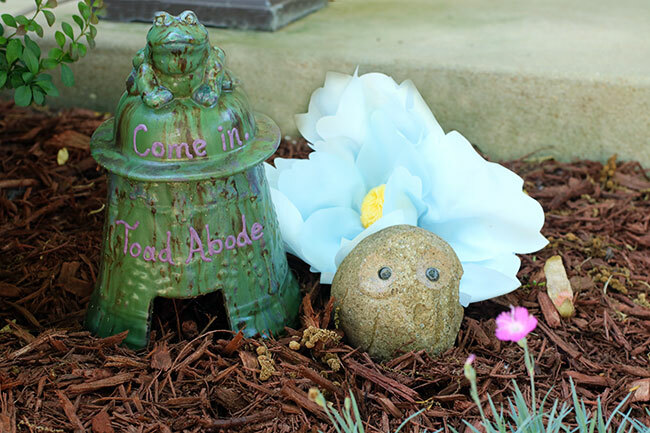 I got this little toad house a long time ago at a craft fair. It has never housed a toad. My owl rock might need to be replaced. My daughter used to always pick it up and play with it and it’s been accidentally dropped a few times. These beautiful faux flowers on stakes are from Here Today (last year). 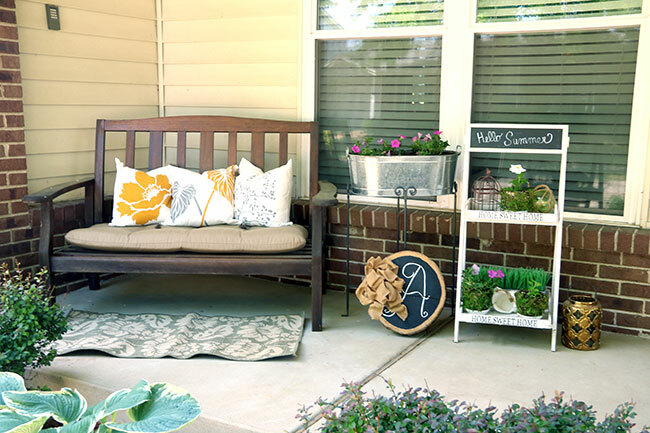 My favorite area on the porch is the sitting area with the bench and my white ladder shelf. 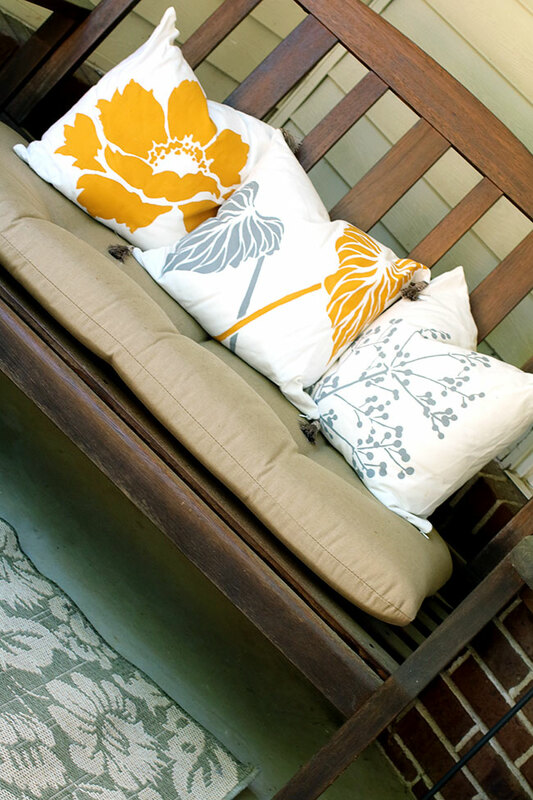 The bench has pillows from Paint-a-Pillow. Yes, you really do paint the design on them! I love to decorate my ladder shelf differently each season. Last summer I had my monogrammed fabric pots on it and this year I made some moss covered pots! Just some more pretties tucked in with my flowers and perennials! 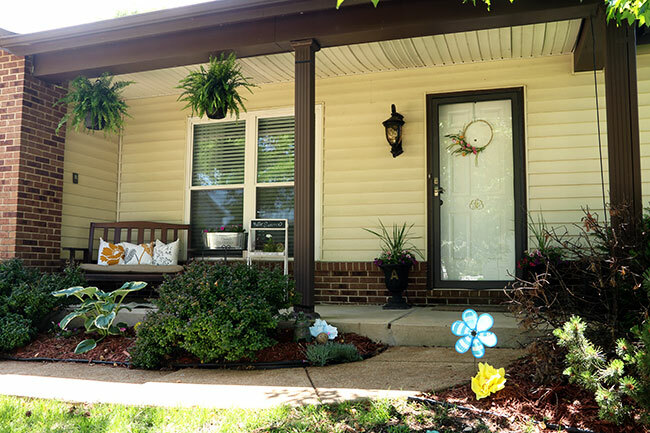 I really enjoy displaying all of my hand made decor on the porch along with flowers, other decor items, etc. It’s fun to change it up a little each season. 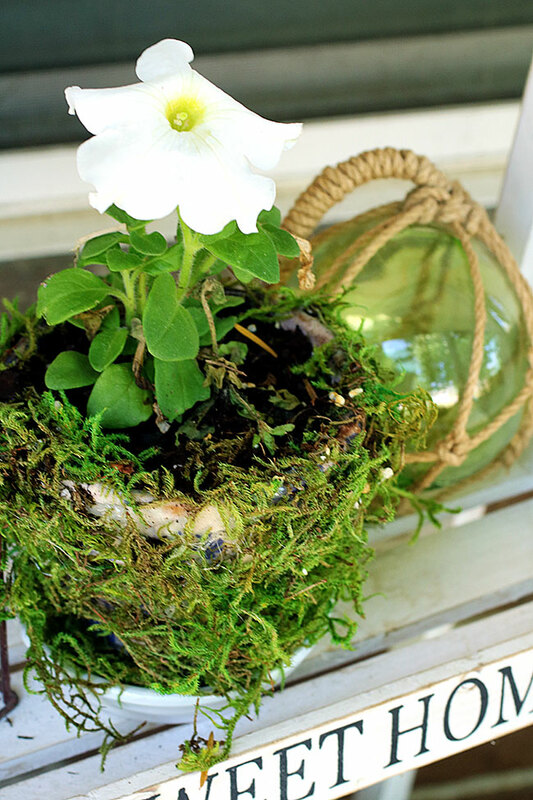 I hope you enjoyed my Summer Front Porch! Next month (June), Lauren and I will be sharing a tour of our gardens! I haven’t done this before, so I am looking forward to it! 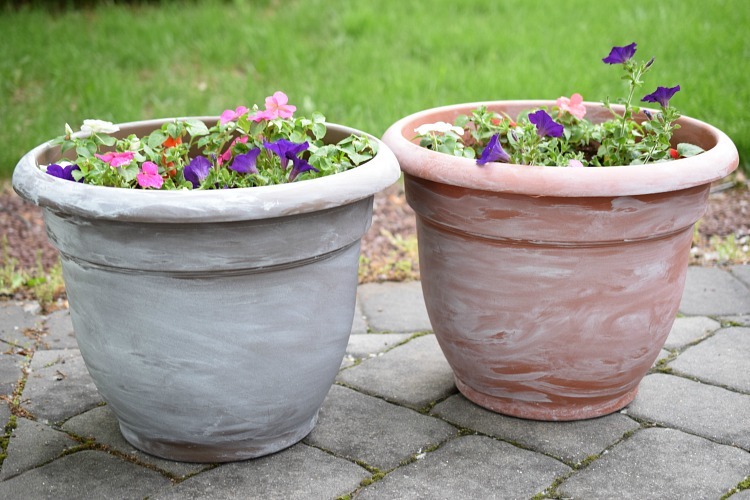 My blogging friend Lauren from Mom Home Guide is sharing her White Washed Patio Pots for her May Summer Gardening Series post, be sure to check them out.